Nowadays, housing space is limited and often expensive, particularly in urban areas. People who are committed to living in the UK’s biggest cities often have to compromise on space and end up living in homes that they feel are too small. This has produced a boom in creative small-space design. 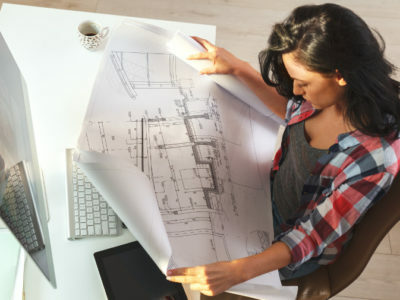 Architects have recognised that design services that help property owners make the most of their space are hugely in demand. 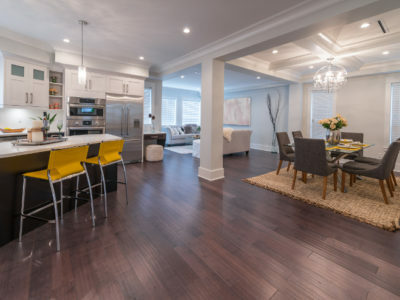 If you have limited space in your home and want to make a change, here are 3 popular small-space design ideas to help you make your property feel bigger. If you have a terrace house or a narrow building plot, you don’t have to resign yourself to a tiny home. If you can’t expand your home sideways, try building up and back. Lots of people don’t like the idea of a long, narrow house as they can often end up feeling small and dark. But this doesn’t have to be the case. Open plan layouts with long sightlines can open a long, narrow property up into a bright and spacious home. If you’re not sure where to start, ask an architect to come up with some ideas for you. It’s no secret that light is the answer to an open-feeling home. But limited wall space can leave a lot of homeowners stumped over how to achieve this. Luckily conventional windows aren’t the only way to let light into your property. Roof lights are hugely popular at the moment, mainly because they’re a great way to bring natural light into a small property. Not only are they ideal for rooms at the top of your property, if your floor plans vary then they can also be used to create strips of light on other levels. If you’re unable to fit windows into parts of your house, glass internal walls can be a great alternative. They can let light into darker areas, making it feel brighter and more spacious. Different glazing styles offer different light and privacy options so you can get the right balance for your home. Bi-fold doors are a great way to maximise any window space that you have. Their wide panes and slim frames let significantly more light into your home than conventional windows and help you to make the most of what you’ve got. While mirrors don’t let any more light into your home than there is already, they are great at distributing it. A strategically-placed mirror can reflect light around a corner and make gloomy spaces brighter. A great way to make a small space feel bigger is to introduce or maximise outdoor space. This can make a property feel more open and stop its inhabitants feeling trapped. Make the most of any outdoor areas that you have, even if they’re only small and functional. If you don’t have room for grass, introduce potted plants or hanging baskets. Try to include seating to make it easier to spend time in these areas – this can be incorporated into walls or steps if space is limited. If you don’t have any ground space to speak of, adding a balcony or developing roof space into a garden are other options. If planning rules make doing these things difficult then a Juliet balcony is a great alternative – they’re limited in size but often don’t require planning permission. So if you’ve got a small home or building plot, don’t despair. With some common sense and small-space design advice, you can create a small property that feels comfortable and spacious. To find an architect, click ‘start my project’ and fill in our online form. We’ll put you in touch with up to 4 architects in your local area.